Librarian in Training: Making Metadata Matter (with Lego)! A large part of my role involves managing the Research Support Ambassador Programme at Cambridge University. This Programme encourages interested staff to learn more about the research process and receive specialist training to enable them to provide a high standard of research support to library users. In addition to taking classes Ambassadors have the chance to work on a group project in order to produce training materials which can be used by librarians across Cambridge. In 2016 one of the three Ambassador project groups (Eleanor Barker, Joyce Heckman and Kirsten Lamb) worked on a project to produce a presentation and teaching activity that could be used to explain metadata and came up with the brilliant idea to use Lego. The following guest post contains contributions from Kirsten Lamb (a Research Ambassador) on creating the activity and Rosie Higman (Research Data Advisor) on how it has been used in practice. As part of the Research Ambassadors programme 2016, Joyce Heckman, Kirsten Lamb and Eleanor Barker came up with a presentation and an activity to help teach researchers about metadata. For the activity portion they settled on the idea of describing the characteristics of an object to illustrate the difference between data and metadata. Since both are (often) abstract, making the “data” a physical object and writing “metadata” to describe it seemed like a good way to simplify the idea, and the simpler the object the easier to delve into the idea that there are many different ways to describe the same thing. The humble Lego brick popped into their heads first, thanks to Lego Serious Play sessions forging the connection between abstract concepts and the brightly coloured plastic bricks. The other useful thing about a brick is that it can represent different things to different disciplines. In social science it might be an interview or a single answer from an interview, questionnaire, etc. In biological science it may be an experimental result. In maths it may be a single number in a complex series. In history it may be a photograph of an event or the GDP of Denmark in 1829. Once you have established the conceit that a Lego brick represents one unit of data, you can explore other characteristics and types of metadata. After participants have described the brick in as many ways as possible, the group came up with an activity intended to emphasise the benefit of creating meaningful metadata, both to allow others to understand and reuse your data and to ensure that you can find the data you’re looking for in future. 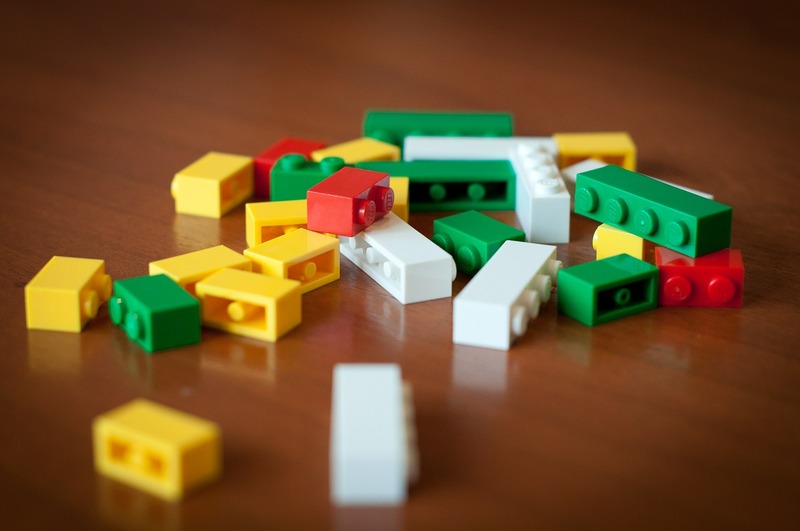 In this activity, participants would try to describe a Lego model, deconstruct it, then get another participant to try to reconstruct the model from their description alone. Meaningful metadata becomes essential when you want to share your data with other researchers. Even finding the data relies upon useful descriptions. Having received this excellent idea from the Research Ambassadors the Research Data team (Marta Teperek and Rosie Higman) were faced with the task of deciding if this could be integrated into our training. At the moment there does not seem to be sufficient interest (or awareness) to run an entire workshop on metadata, so instead I looked at where it might fit into our existing ‘Introduction to Research Data Management’ workshop. This workshop runs for 2-3 hours on a regular basis for PhD students and postdoctoral researchers in different departments, covering everything from file backup strategies to funders’ requirements to share research data. Whilst file names and organisation are included in the introductory workshop there is not a specific section on metadata, so for the first attempt we placed the exercise at the end of the section on organising physical samples. As the workshop was already quite busy I realised we could not complete the entire activity in the time available, and so decided just to do the second half (making, describing and reconstructing models) as this would have the most impact on researchers. In particular, I felt it would be valuable for researchers, who are increasingly being asked to share their research data alongside their publications, to see how hard it is to re-use someone else’s data without meaningful metadata. We have now run this exercise in several workshops and it is consistently popular with participants across the disciplines. The models built have varied from sausage dogs to abstract towers, and most groups struggle to recreate their colleagues’ models, emphasising the importance of good metadata. As with all our activities and workshops we are refining the Lego metadata activity on the basis of participant feedback and our own observations. In order to save on the amount of Lego we needed we ran the exercise with researchers working in pairs or small groups, this worked well in terms of allowing them to network but it was clear after the first workshop that I had not allowed enough time for the activity. Participants became very enthusiastic about their models and so spent a long time discussing it with their partner and then, after swapping descriptions, debating how the other pair’s model should be reconstructed. To get around this problem I lengthened the time allocated for the exercise, reduced the number of Lego bricks each group had to 6 and started using a bell to let participants know when they were running out of time. After running the activity a couple of times it seemed like it might be in the wrong point in the workshop; we had not yet introduced the idea of data sharing so researchers were sometimes initially confused by discussing having researchers around the world use their data. This turned into a good opportunity as the section on data sharing is quite long, and did not have any interactive elements, so we moved the Lego exercise to the end of this section when researchers have been introduced to the principles of sharing and when we are about to discuss repositories. The new position of the activity has been more effective, with researchers able to see how hard it is to use data which is not properly described. The only difficulty we have now is making sure that researchers do not get distracted by the Lego for the rest of the workshop!